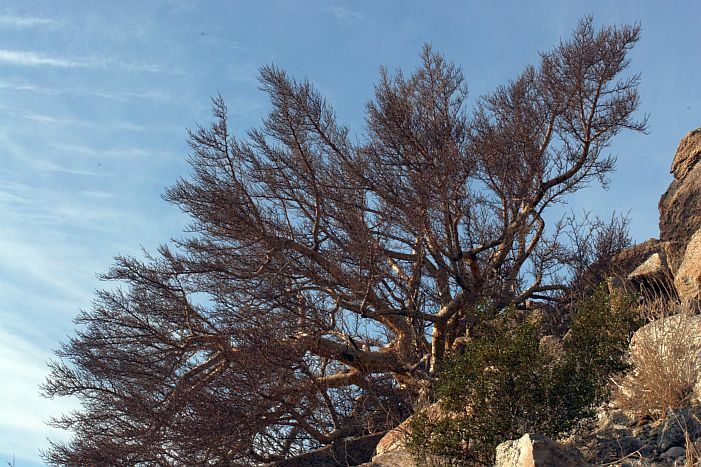 For an introduction to this page, see Plant Species of the Borrego Desert: Burseraceae: Bursera microphylla, elephant tree. The Elephant Tree herd in the Santa Rosa Mountains on the east side of Clark Valley was not discovered until the early 1980s, and there is little easily-available information about their location other than northeast of Clark Well, toward Barton Canyon (Lindsay and Lindsay 2002, p. 99). Someone in the Park Service undoubtedly has GPS coordinates of this herd, from a dedicated helicopter survey with GIS capabilities in January 2000, but we were unsuccessful in several attempts to obtain the coordinates. 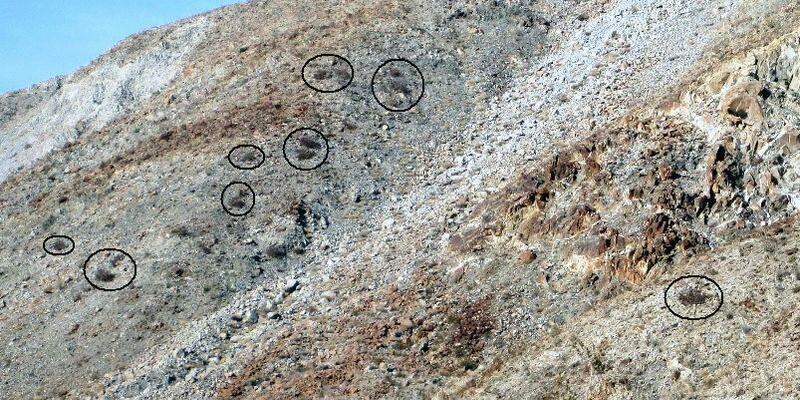 That helicopter survey estimated the herd contained over 160 individuals (Lindsay, Anza-Borrego A to Z, p. 154). In three days of field trips in December 2008 and December 2009, we located the herd and collected the first voucher of this location. This page shows in detail where these trees live. 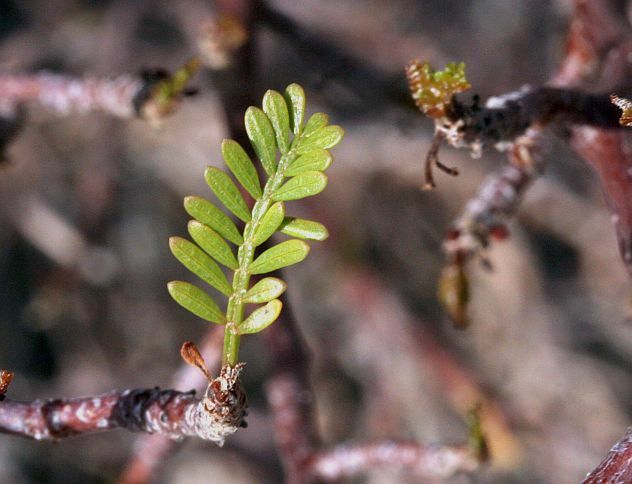 For botanical field reports of the first two trips, see 9 December 2008 (the probable "pygmy-cedar, Peucephyllum schottii" plants were actually the elephant trees!) and 12 December 2008. The third trip was on 19 December 2009; all the pictures below are from that trip. Warning: the trees live on a very steep, unstable bouldery slope that could be dangerous to traverse!. We recommend that you only get close enough to be able to see the trees with binoculars. 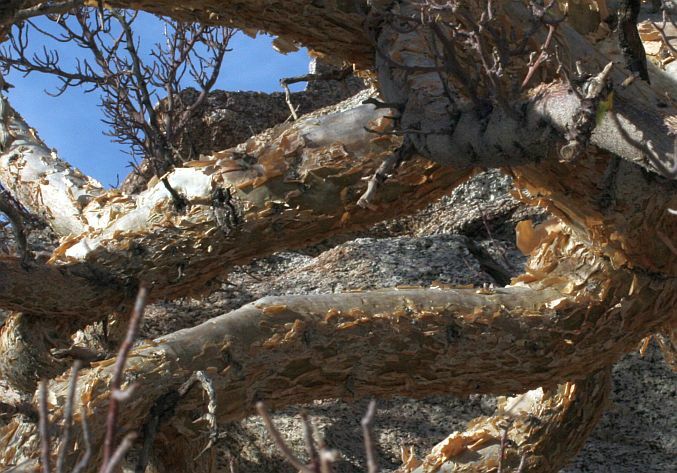 If you want to see an elephant tree up close, go to the Elephant Tree Discovery Trail six miles south of Ocotillo Wells, or to Torote Canyon. In both places it is an easy walk to an Elephant Tree. This grove is often touted as being the northernmost location of elephant trees, but the Martinez Canyon grove in Riverside County, about nine miles directly north, was vouchered in 1939 by Marjorie Clary (RSA452173; JEPS46418; and JEPS9627). 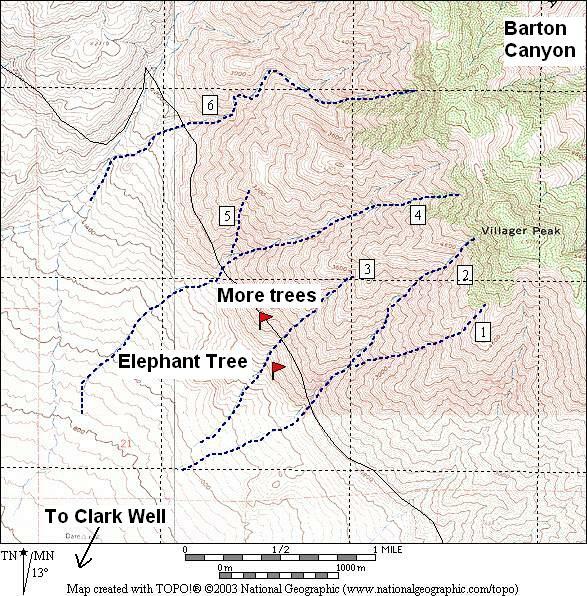 The elephant trees were indeed very close to the line from Clark Well toward Barton Canyon. Note how close together the elevation contours are where the trees occur, showing how steep the slopes are here. The coordinates of the more distant grove roughly form a triangle, and thus the three corners of the triangle are given above. Clicking on the above picture, and all subsequent ones, gives the same picture without labels, sometimes in a larger format. Note that not every dark spot seen in the previous photograph turns out to be an elephant tree on closer inspection. 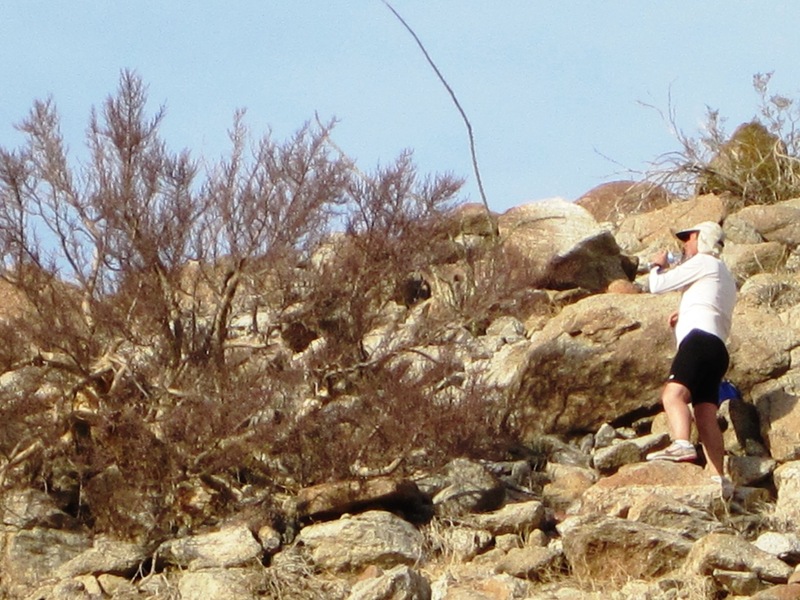 Boulders often have a very similar appearance, and both creosote and ocotillos can produce similar dark blotches. In fact, we found these plants on our very first survey, but thought that they might be Peucephyllum schottii, desert pine, aka desert fir and pygmy cedar, which grows in similar habitats and looks similar from a distance. Peucephyllum schottii does grow in this area, in the alluvial fan of the main drainage below Villager Peak (below the merger of drainages 1 and 2). The key discriminants from afar are: the shape of the plant, wider than tall; the purplish color of the plant seen best in the photographs below; and the density of the branches. The eye, using binoculars, is better at picking out the plants than photographs. We've circled additional specimens in the following more close-up view, and often the circles in the previous photographs turned out to contain several elephant trees. There are probably additional specimens in this picture, but it is difficult to be sure from this photograph alone. 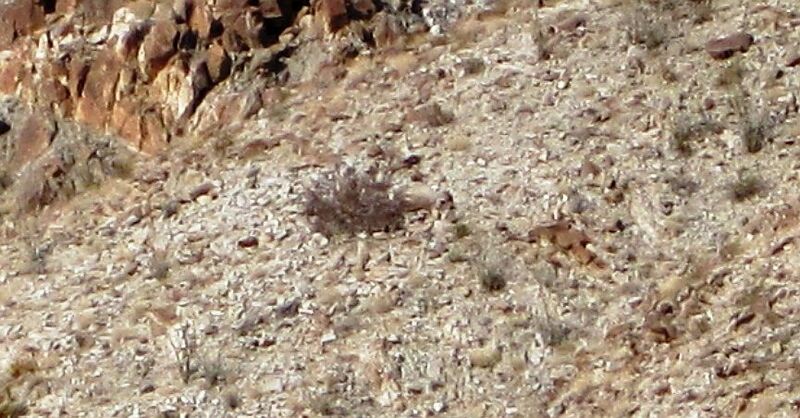 In this photograph, it is fairly easy to see the different appearance of the elephant tree from the surrounding ocotillos, creosote bushes and boulders. This is the tree we vouchered. 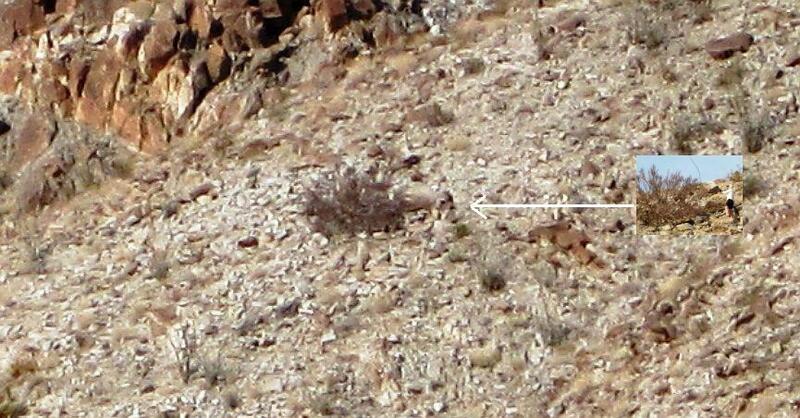 This picture was taken from about 100 feet elevation below the tree. Even to get to that location resulted in one good fall; to get to the tree itself resulted in several falls, all due to loose boulders. This area is so steep and bouldery that it required one person below, to tell the person above where to go to get to the tree, since it was difficult for the person above to see the tree from the best climbing path. Jim estimated that this Elephant Tree was about 10 feet tall and 30 feet in diameter. The trunk was about 18 inches in diameter and had peeling bark. The tree smelled of sweet resin. The branch tips tasted like sweet resin with no turpentine flavor. Copyright © 2009 by Tom Chester, Mike Crouse and Jim Adams.